Ahhhhh, nothing finer than to be outside in the shade with warmer temps and a light breeze. I had the opportunity to do this on Saturday. The shade was courtesy of a couple of cypress trees with knees galore. The far shore view of a small pond enticed me with the colors of new and old vegetation. This is one of three ponds where Canada Geese breed and raise their young. 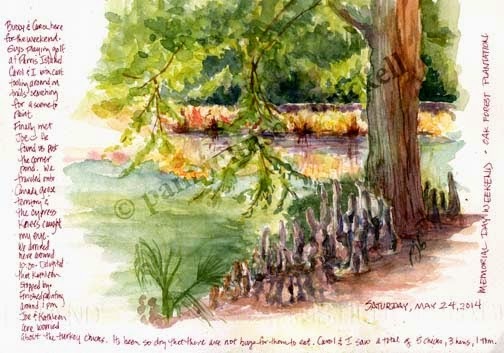 The geese were wary and stayed around the farthest pond, honking for the first half hour, then settled down. 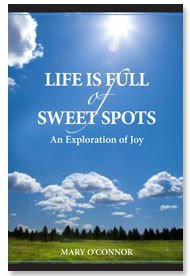 I was sitting in our golf cart, my supplies spread out on the seat beside me. I used a combination of traditional brushes and waterbrushes. All but the lettering was done on site. Dragon flies and water-striders were everywhere. The call of red-winged blackbirds filled the air. 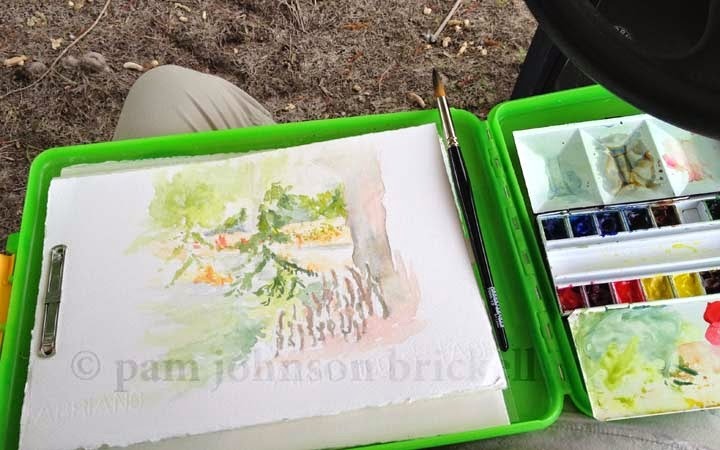 This is my first plein air sketch on the private plantation I wrote about in March. The owners were out looking for turkey hens with their chicks. They are very concerned for the turkeys, as we're in a dry spell and the insects that the chicks need to survive are not hatching without the rain. I saw a total of 3 hens and 5 chicks. There has already been mortality among the chicks...... Water is so very precious in all its forms.